Poor, dry soil in full sun might be considered a tough place for plants but this cheerful yellow combination will do well there. The yellow of the coreopsis ‘Zagreb’s’ flowers echos the yellow strip of yucca ‘Golden Sword’s’ leaves while the delicate, airy cloud created by the foliage of coreopsis ‘Zagreb’ contrasts and softens their boldness. The combination has long season interest starting in the spring when the foliage of coreopsis ‘Zagreb’ joins the evergreen Yucca ‘Golden Sword’. The interest continues into summer when coreopsis ‘Zagred’ produces its yellow flowers over a long bloom time and is highlighted by the emergence of cream colored flowers on a tall stalk from the spiky clump of Yucca ‘Golden Sword’ leaves. Even after the flowers disappear in fall and coreopsis ‘Zagreb’ dies back after the first frost, Yucca ‘Golden Sword’ continues to add color all winter. For a bold architectural look, yuccas are outstanding. 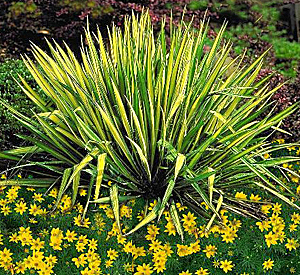 Yucca ‘Golden Sword’ also adds color with its yellow leaves edged with green. The sword-like leaves grow in slow growing clumps that produce a spike of creamy white flowers in mid-summer giving added height to the garden. Cut the flower stalk to the ground after flowering to keep the combination looking good. The highly dissected leaves of this coreopsis is well described by “threadleaf”, part of the common name of this highly desirable coreopsis. 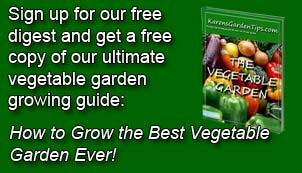 The lack of large leaf surface area makes this plant very drought resistant so it is ideal for dry soil. The bright yellow flowers cover the compact upright bushy plant most of the summer. When flowering slows down, cut the plant back for a fall rebloom.